The Valemount Museum, located in a historic Valemount railway station, has something for every member of the family! 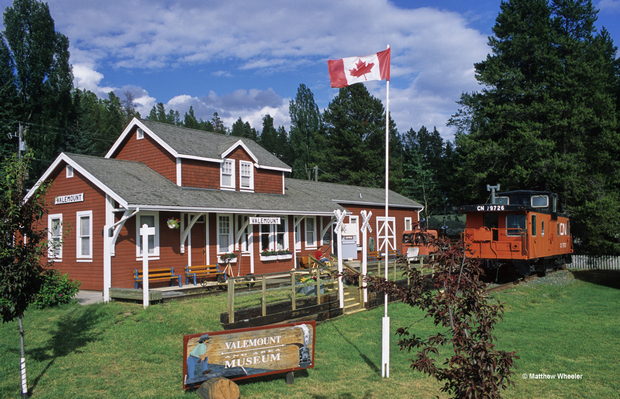 The Valemount Museum is a designated Heritage Railway Station and building. Welcome to the Valemount Museum! Built in 1914, our building has three levels, the main floor, an upstairs, as well as the basement. On the main floor, we have displays on railroad towns, Japanese Internment camps, Valemount pioneers, local War Heroes, and more. Some of the artists on display include Margaret McKirdy’s sculptures, and James Vanslyk’s art. We have recreated an outfitting and trapper’s cabin in our basement. Additionally, there is the Ishbel Cochrane exhibit, created in memory of Ishbel Cochrane. This exhibit also features the Hargreaves Brothers Outfitting Company, and the historic Mount Robson Ranch, where Ishbel grew up. The Museum’s upper level contains a bedroom and school house display. In addition we have a restored Standard Cupola CN Caboose, as well as the annex. The annex contains local logging and farming artifacts. Learn more about the Museum, and Valemount’s history. A list of our currently available exhibits and displays can be found here. While you’re here, check out our gift shop. We keep it stocked with locally published books, pamphlets, Canadian National Railway items, and more. In case you can’t make it here, there is also a selection of our historical booklets available in our online store. The archives are located in the basement of the library across the lawn. For archival services, please visit research and services. * A family includes up to 2 adults & up to 4 children (under 18 years old) . View our list of known issues with our geocaches here.